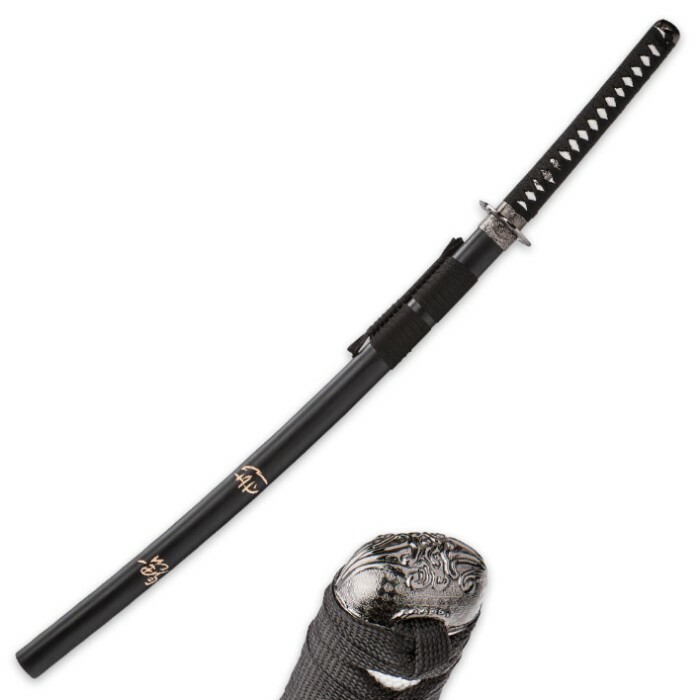 Inspired by the movie "The Last Samurai" this katana is one of the most popular swords on the market. From the second you hold this beautiful sword you will appreciate the workmanship and attention to detail. Shipping was a bit slow, but because of Christmas I understand, very nice sword ! , their is a minor problem when you draw the sword from the scabbard a little black rubber like substance gets on the blade. It came with chips in the blade and extremely dull, but with a little work I have a nice edge now ! Very pleased overall ! I would definitely buy one, or another one ! You can not beat the deal, period, thanks budk, great deal again !!!! My wife is a fan of the walking dead. She was always taken with the katana on the show. I purchased this to satisfy her desire to have one. I was amazed at the quality of this katana. It is very well made and a great deal and my wife is thrilled with it. Don't pass this one up its a great display sword also came with a tag that show the authenticity. I even watched the movie again. Great for the price. Have it sitting on my bar with the stand that it came with. got this sword as a gift. it is a very beautiful and well crafted sword but is basically a wallhanger.. it says carbon steel but i've tried to sharpen mine but to no avail. pretty sure it's rat-tail tang as well.. if you want a functional version, get the musha- full tang version.. that's my next purchase !! I didn't expect much for $20, but this sword is beautiful! The blade is sturdy and comes with a slight edge which I might sharpen further. The handle is thick and sturdy and almost too good for this sword. Same thing with the guard(tsuba). The scabbard (saya) is excellent as well. The carvings look and feel hand made. Great looking and feeling sword all together. Comes with a display stand as well. A beautiful addition to my collection. Thanks again BudK! Very nice and sturdy sword! With the stand and for the price you can't go wrong! This is my first sword from True Sword, as well as the first sword I've bought in over 6 years, i do not regret this purchase. It is such a beautiful sword and has a good feel to it. My only issues were that in the scabbard, i assume there is some black residue as whenever i pull out the sword, it has that. The hilt is a little loose for my taste, nothing that i will see to be a problem. Overall perfect, just wished the scabbard wasn't dirty on the inside. Overall, i'd recommend buying it. 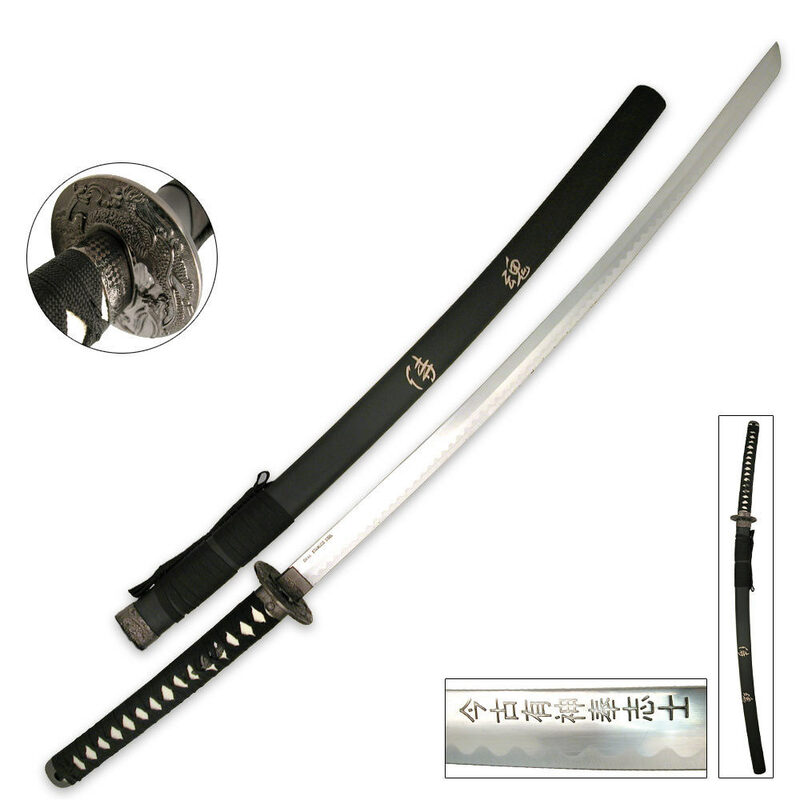 This is a fantastic sword/katana. For the price none of the other swords on this site that i've seen are as good. You get the marvellous sword and a great stand(which is a pain to put together). Everything on my sword is perfect, nothing is loose the handle wrappings are tight, the blade is in place and straight, everything from the guard up is metal so that`s great. One small thing is that when ever I unsheath the blade a little bit of the rubber inside the scabbard comes with on the tip of the blade. I would recommend this wonderful sword all the way.